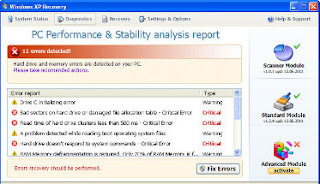 Windows Vista Recovery is a fake computer optimization software, which is a clone of Windows XP Recovery. The program is installed onto your computer with the help of trojans through system holes that insecure. Moreover, the rogue might come together with some malicious application. As soon as Windows Vista Recovery is installed on your computer, it will start a scan and report 11 critical errors e.g. "GPU RAM temperature is critically high. ", "Hard drive doesn't respond to system commands", "Registry Error". Next, it will ask you to purchase the software to fix any of them. Critical Error! Windows can't find hard disk space. Hard drive error. Remember that you should never trust this fake application and ignore all that it will display you. Remeber, Windows Vista Recovery pretends to be a legitimate PC optimization tool but in reality is totally scam. You should remove it as soon as you notice it installed on the system. Follow the Windows Vista Recovery removal instructions.